My Other Polo Bike aka "Monster"
This is one of the bikes used for the bike polo scene in the movie “What Happens In Vegas” and believe it or not, Cameron Diaz rode this bike. Now it’s mine and I ride it sometimes and loan it to visiting polo players sometimes. 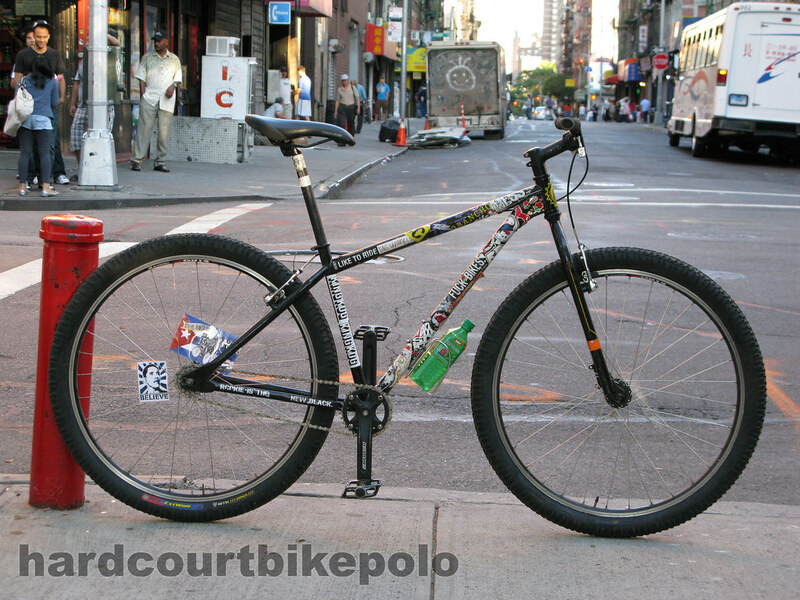 I even did Dy-lan’s Invade Guantanamo Bay alleycat on this bike and finished 4th. Besides that, it’s just a place to put stickers. This entry was posted by Doug D on September 21, 2008 at 12:01 am, and is filled under Bikes of Polo, Photos. Follow any responses to this post through RSS 2.0. You can leave a response or trackback from your own site. Oh I am for sure getting one of these for winter! i love this bike. i love taking it high speed into the corners of the pit when i’m in the city. i love riding it across the bridges too, it’s like a f’n SUV. thanks doug. my girlfriend wants to know if cameron diaz hit you in the head with her mallet…. where did u get that Obamer spoke card? nice. 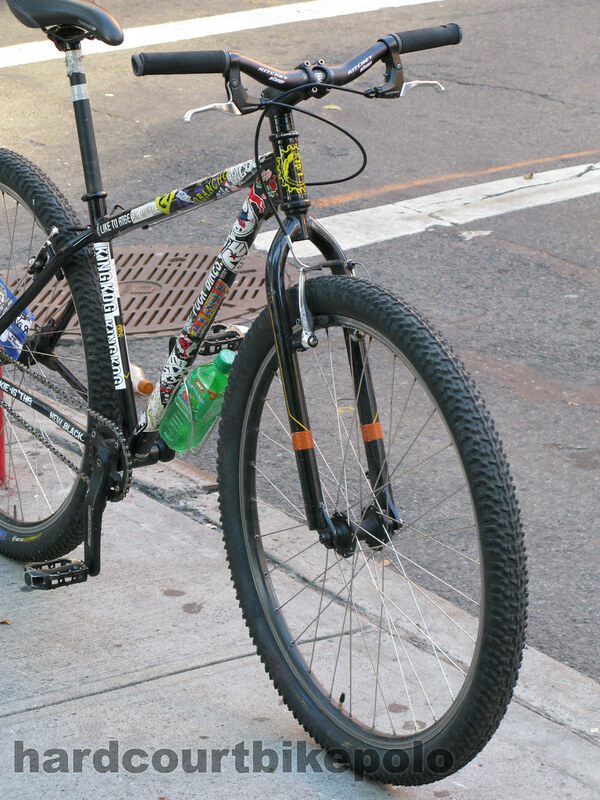 Awesome bike! You could probably retire on that thing. doug, what size frame is that? 19 or 21″? Dont know, It’s what Redline calls a Med. and it fits you, or is just usable for polo? 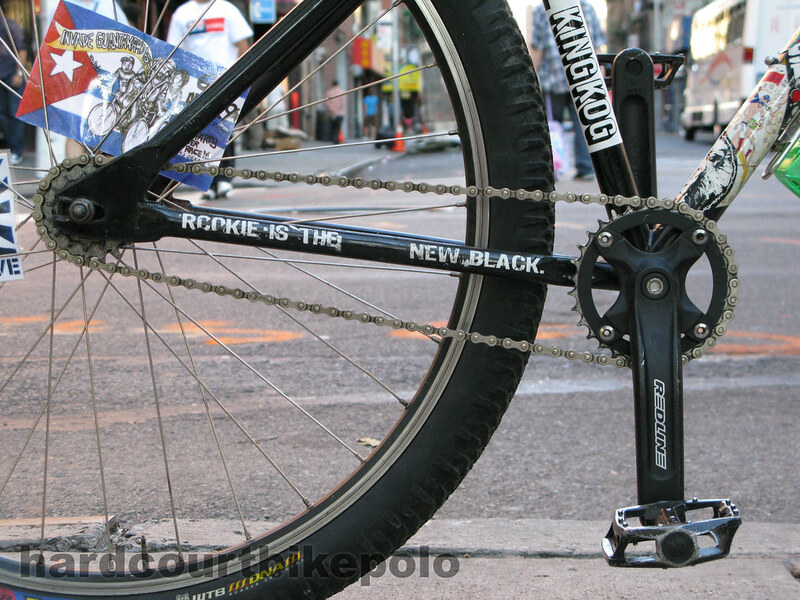 did you add an extra long seatpost? Forget the 15t and spacer that’s next to the stock 20t and what you see is a stock bike. The seatpost is like a yardstick, longer than the seat tube. And yes it fits, well enough.